Johan von Konow and his wife set out to accurately model their summer home with the help of a repaired laser cutter. 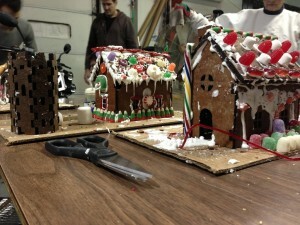 They modeled the home in Rhinoceros 3D and baked their on gingerbread dough. Now, we might be a bit freaky, so much so that we prefer the smell of laser burnt wood, but Johan says the smell of cutting gingerbread was somewhere between burnt cake and burnt hair. On the other side of the world in Madison, Wisconsin (Johan is in Sweden), the Hackerspace / Techshop Sector 67 had a similar idea. In fact, cutting gingerbread with their was one of the first things they did when they received their laser cutter. Using their newly minted 150W laser cutter, they created some almost edible creations with the help of some local children. On top of all of this they include a great recipe and details of how to go about doing this on your own. 'Tis the season for 3D Printed Christmas Cookies!